Tri-color dog. Yes, we’ve added to our pack – meet Bisbee (formerly Bella) who is a foster pup staying with us for a while, or maybe permanently, depending how well the next couple-few weeks go. She’s a very sweet, adorable little beagle about a year old who is getting along pretty well with Frankie so far, even though she is completely irritating to him when she leaps repeatedly in his face and falls all over him. Two beagles smell something? Who’d have thunk. Bisbee in the back yard, exploring. 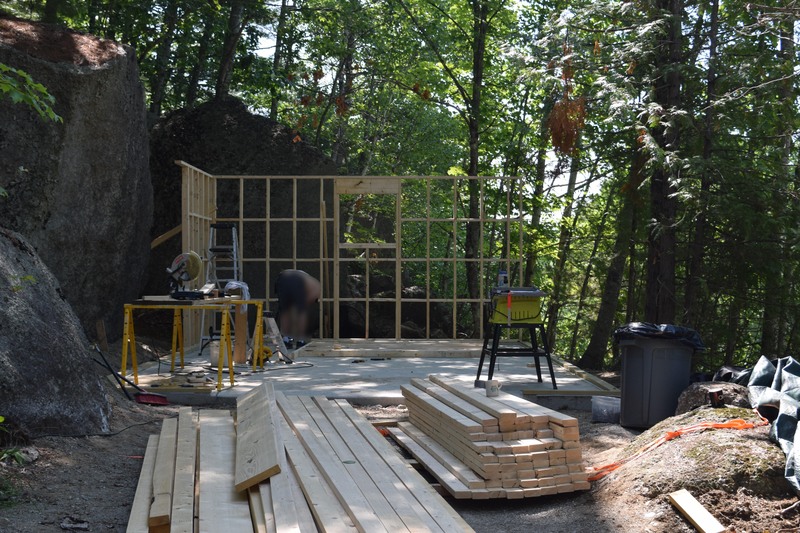 We have now turned to working on the garage – albeit slightly slowed by Puppy Weekend – but now have all but two small wing walls raised. (No pictures from today – it was really wet out – like living inside a cloud). We have to say, it is kind of awesome to work on a flat job site with brand new materials! Things go so quickly this way. The upcoming week is for finishing walls and getting the roof structure together. There’s a heck of a pile of lumber and materials out there, which is getting irritating since there have also been a bunch of unexpected rainstorms, and it’s really humid. Not the greatest weather, but it’s supposed to get better soon. Frankie LOVES the lumber pile! Especially when the sun is out. Best seat in the house. We can use the front door again! The decking is on, and the porch is solid, sturdy, and sylish. As usual, almost all of the hardest and most important work is invisible. First, there was getting rid of all the yuck. Before was kinda like this. And you could see right through in several places. Then, building fresh – starting at the foundation. Digging, then block and concrete. And since there was no porch, we had to MacGyver the stairs elsewhere. Before we could put on the decking, we needed new cedar posts for the porch. Originally, we planned to re-use the old ones, after cutting off some rot and creating capitals at the top to make up the length. Alas, only about two had enough good wood to use. And, we had a hard time finding logs nearby – most of the cedar dealers are in other parts of the state. K’s persistence paid off when he talked through two guys to get to another guy who had a pile of cedars in a pasture he was clearing – and the price was perfect. So, we got to go last Saturday morning, pick logs (get our feet incredibly wet), cut them, peel them, and put them in the same day. Then we ready for the decking. In the truck by 10 am, and home by 10:30. And now…decking! We can’t afford the fancy exotic woods (plus they’re totally not local), preferred not to do cedar, and I can’t deal with pressure treated…so we crossed our fingers that Craigslist would have some composite decking. We found a guy with plenty of decking that had been removed from his newish deck (that fell over! someone didn’t do their prep work properly), and at about 1/3 the price of new. Sure, it has some screw holes, but we managed to generally arrange boards so they were cut off or reused, and I’ve got some color-matched caulk to fill the remaining few. The porch floor is 99.7% done! And there’s furniture to relax and enjoy the view. Yes, new stairs and railings still to come, but at least we have our porch back. New corner – much improvement. Looking the other way. So much cleaner, not to mention solid. The new furniture (snagged on sale!) looks great here.